This sandwich is bursting with flavor! 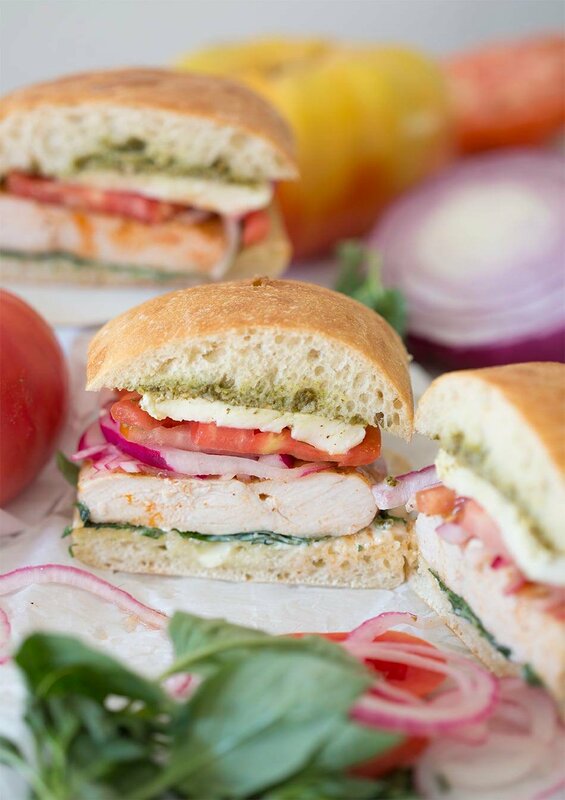 Baked chicken breast, fresh pesto, mozzarella, and basil with pickled onions, and a loaded mayonnaise all in a fluffy ciabatta roll! A chicken sandwich might seem super-plain and ho hum but it definitely doesn’t have to be! So many ways to amp up the flavor! Start off with a spice rub for your chicken breasts, make a zingy pesto, and toss in some quick pickled onions for acid and bite. I loved this sandwich but you can almost think of it as a blank canvas to which you can add any of your favorite ingredients. You’ll know the chicken breasts are done once they reach an internal temp of 165F. Grilling the chicken will add even more flavor, just don’t let it dry out! Add some jalapeños to the onions before pickling them for an extra kick. I love the creaminess of fresh mozzarella but feel free to use your favorite cheese, I’m trying an aged gouda next time! For more a peppery kick try mixing in some arugula with the basil. If you have a blends then I really hope you try whipping up batches of pesto. It’s SO EASY and there’s just no way for store-bought varieties to compete with anything you make. I always recommend toasting your pine nuts first to maximize flavor. If you can’t find them at the market or they’re super-expensive you can sub in toasted walnuts, which are also very delicious in a pesto. Spread your nuts on a baking sheet and toss into the oven, which you preheated to 350F and bake for 5-10 minutes or until golden brown. The main thing to remember when you toast nuts is that the edges will brown and burn first so take the baking sheet out of the oven after a few minutes and mix them up! Preheat oven to 350F. Clean and prepare chicken breasts. In a small bowl combine spices. 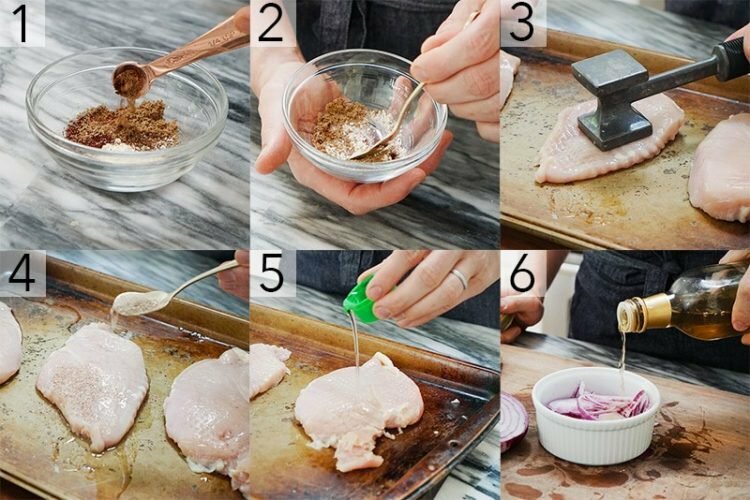 Transfer the chicken breasts to a baking sheet. Cover the chicken breasts in spices. Drizzle some olive oil. Cook for about 25 – 30 minutes or until golden. While the oven is hot, slice the ciabatta rolls in half. Transfer to the buns to a clean baking sheet and toast for about 5 – 10 minutes. 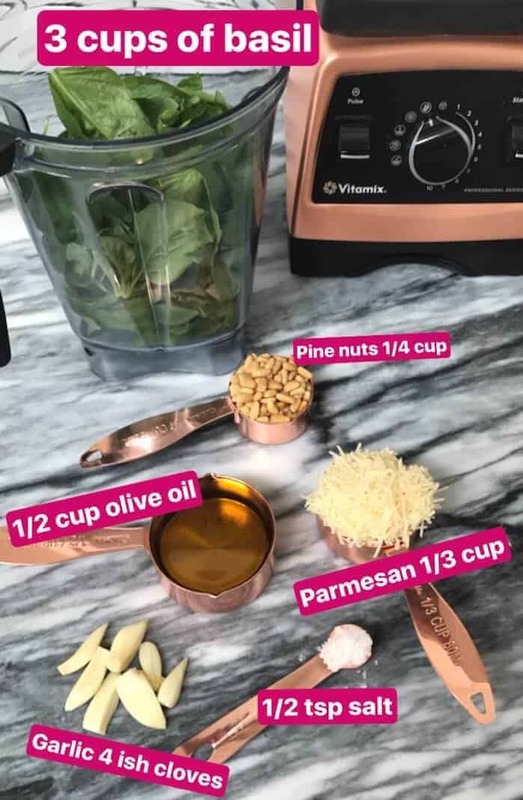 Place basil, parmesan, salt, walnuts and garlic into the blender. Pour in olive oil as the blender begins to blend the original ingredients. Chop onions. Transfer to a bowl and pour champagne vinegar over to pickle. Slice the tomatoes, mozzarella, onions and basil. Spread mayonnaise on one piece. Add pesto to the other piece. Layer prepared ingredients around the cooked chicken breasts. Cover and cut to serve. 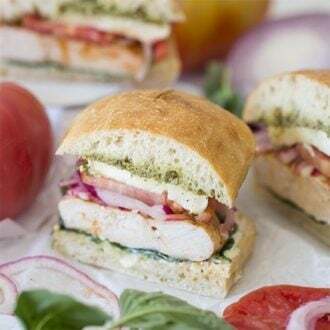 If you’ve tried these sandwiches then don’t forget to rate the recipe and let me know how you got on in the comments below, I love hearing from you! Clean and prepare chicken breasts. Transfer the chicken breasts to a baking sheet. Tenderize the breasts with a mallet. In a small bowl, combine spices and mix. Cover the chicken breasts in spices. Drizzle some olive oil. Cook for about 25 - 30 minutes or until golden. While the oven is hot, slice the ciabatta rolls in half. Transfer to the buns to a clean baking sheet and toast for about 5 - 10 minutes. Chop the onions into slices. Transfer to a bowl. Pour champagne vinegar over to pickle. Place basil, parmesan, salt, walnuts and garlic into the blender. Pour in olive oil as the blender begins to blend the original ingredients. Blend until smooth. Mix the mayonnaise, minced garlic, horseradish, and lemon zest together and set aside. Slice the tomatoes, mozzarella, onions and basil. Spread mayonnaise on one bun. Add pesto to the other bun. Layer the prepared sandwich ingredients around the chicken breasts. You'll know the chicken breasts are done once they reach an internal temp of 165F. Grilling the chicken will add even more flavor, just don't let it dry out! I love the creaminess of fresh mozzarella but feel free to use your favorite cheese, I'm trying an aged gouda next time! Ive never made my own pesto before. This was good! Nothing better than a good chicken sandwich.